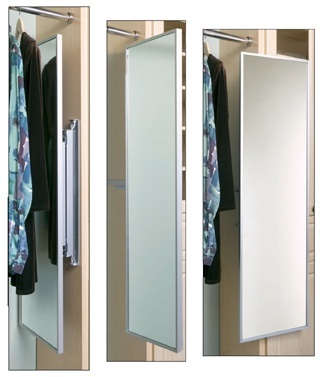 The invention of the pull-out mirror for closets is one of the best-kept secrets in the closet industry. Lots of people have full-length mirrors, but almost all are fixed to a wall. Our customers feel the pull-out, pivoting version we offer is a better option! The reality of the matter is that a full-length mirror is only actually in use 5% of the time! Otherwise it sits unused, and when mounted on a wall, eats up valuable storage space. The solution: a pull-out mirror! A full-length glass typically measures 14” x 48”, which in a closet that measures 4’ x 6’, or 24 sq ft, is allocating 20% of the wall space for a stationary mirror. Put it in the closet, where it belongs. 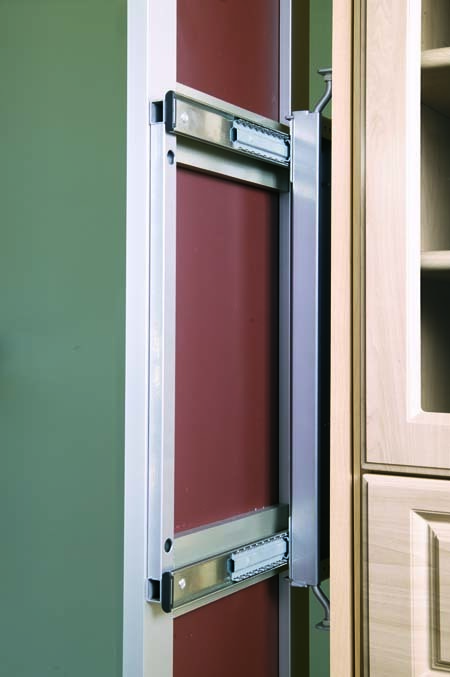 By contrast, a pull-out glass measures exactly the same, but because it is mounted to a vertical panel and with full-extension ball bearing slides, takes up only 3” of hanging space. Many space planners and closet designers put a mirror in a long-hang section so that this area of the closet has multiple uses. Another great application for the glass is on an end panel that normally would go unused. The elegance that is reflected in the thin design and fine lines of the mirror frame make it the perfect finishing touch for any closet design. View our online gallery of additional must-have, organizing gadgets and options.